The effects of shock waves (SW) generated by the Dornier XL1 experimental lithotripter on the growth of AT2 prostate tumor cells were examined. The tumor cells were implanted subcutaneously in the right hind limb of male Copenhagen rats. Tumor growth was delayed one to two days after 2,000 SW which was consistent with a 60% to 70% killing of clonogenic cells observed in tumors excised 24 hours after treatment and analyzed by a soft-agar cloning technique. When the tumor reached 2 cm to 2.5 cm in diameter, the right limb harboring the tumor was amputated in animals receiving shock waves and in the control animals. In the group exposed to shock waves, two of 14 were found to have lung metastases at sacrifice two to four months later. By comparison, in the group not exposed to shock waves, three of 14 developed lung metastases. This comparison suggests that exposing AT2 tumors to shock waves apparently does not enhance the metastasis of tumor cells. Injection of cisplatin (1 to 6 mg/kg) 15 minutes before shock wave exposure increased the killing of clonogenic cells, compared to those treated with drug therapy alone. The effects were at least cumulative. Tumor growth also was delayed substantially by the combination of cisplatin and SW treatments in comparison to either modality alone. 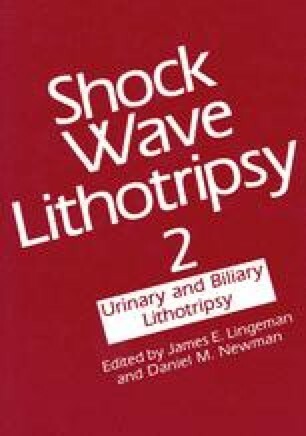 These results indicate that lithotripsy could be a useful adjunct to chemotherapy in suppressing tumor growth. Supported by a grant from Dornier Medical Systems, Inc., Marietta, Georgia.